"As someone who loves all things gaming, Marvel and Bobble Heads, Super Loot was always going to be the box for me. It’s the perfect monthly delivery of all things geek and gaming, and it certainly kept me entertained. If you, or someone you know, can’t help picking up a new Bobble Head each weekend or loves nothing more than a cheesy gaming t-shirt, Super Loot is the one. Sourcing the diverse selection of items myself would have been a nightmare, especially with the recent release of Deadpool. I also couldn’t believe the generosity of the box and the money I saved thanks to my subscription. Superloot is one of those products that you know was put together by people with the same love as you! The box itself was simple but branded with their striking logo on top. It was of robust build and meant I had no concern about any of the items inside getting damaged. On opening the box, everything was packaged neatly, and I was immediately able to see what I’d received in my box along with the clear running theme for the month - Deadpool! Once I started to pull the items out of the box, I could see there were so many things packed in for me to go through. I hadn’t thoroughly researched the box before subscribing so was only expecting 2 or 3 items for the price, but was pleasantly surprised to find a total of 6 things! The Deadpool theme was perfectly timed with the release of the movie in the cinemas, which showed that the team had evidently planned to keep their box relevant, timely and meant I had something to relate to with each item. While there was a box theme, the items weren't exclusively 'Deadpool' which allowed for anyone who may not have been able to connect in the same way I did. My box included a Deadpool t-shirt, Deadpool cufflinks, a Deadpool Bobble Head, a Star Wars topped pen, a Sea of Thieves certificate and a PacMan Vinyl Figure. Each item was securely and separately packaged which meant they all stayed safe in transit and were easy to work out what was what. There wasn’t anything to explain each item within the box, but it was pretty simple to figure out. I live with people who are equally as much of a Deadpool fan as me, so I was actually able to surprise and share the items with them too which was nice. Unsurprisingly, every one of the Deadpool goodies was rapidly claimed and are now being thoroughly enjoyed by all! 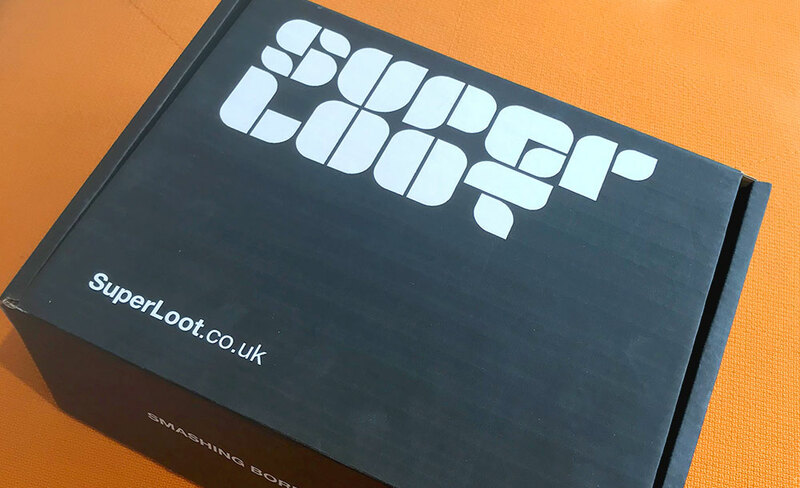 The Super Loot Mystery Geek Box costs £24.99 monthly, or as low as £21.67 if you pay annually. To source all of the items alone would have taken both a lot of research and definitely around double (or more!) of the subscription box cost. I also felt that if you weren’t desperate to keep an item, it gives you the option to gift it to your geeky friends and share the excitement of the box! The annual subscription is definitely worth the saving and something I will now look to do myself. Because it’s such a fun and exciting box, giving this to someone as a gift would be ideal. It provides variety, fun and a selection of their favourites in a well thought out package - I think any geek or gaming fan would love this box. Overall I have enjoyed receiving the Super Loot Mystery Geek Box. If you’re looking to channel and release your inner gamer in the form of a monthly delivery - this is the one for you! It’s ideal for anyone who loves gaming or is always watching the latest Marvel film on the opening night and can’t help buying geeky trinkets to show off their passion. You won’t find this variety anywhere else, so why not treat yourself to a mystery monthly geek fix today?" Unveil an exciting assortment of cool collectibles and nerdtastic gadgets with every delivery of a Super Loot Mystery Geek Box. Satisfy your geeky needs and shop yours today!